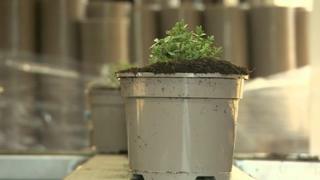 The switch is being driven by nurseries in the Midlands and by a Tipton company that makes 100 million plant pots every year. Recycling black plastic is hard and that's because recycling facilities sort plastics by bouncing a beam of light off them. Since black plastic absorbs light, it can't be sorted and goes straight through the system and off to landfill or incineration. But nurseries and plastic plant pot manufacturers in the Midlands have been working to do something about that. Black plastic is a great choice for plant pots. It's affordable and can survive being outside at a garden centre with no ill effects. Importantly, the black colour stops light getting to the roots of plants which can cause problems. And within the industry there's a lot of recycling of black plastic. The pots themselves are made almost entirely of recycled waste plastic from car manufacturers and many larger nurseries collect the pots and send them back to the maker for recycling. The problem is once they reach us, our kerbside recycling can't cope and the pots eventually end up in landfill. But now a new colour of pot is poised to solve all these problems. The taupe pots (it's a sort of mushroomy greyish brown) are being made by a company in Tipton. They make 100 million plant pots a year. And they are already appearing in commercial Midlands nurseries ready to hit garden centres from early next year. The new pots look good and protect plant roots from light but have the major advantage that they are easily identifiable as recyclable by the machines that sift through domestic waste. It's extraordinary to think 100 million pots once destined for landfill could now be recycled instead.